Whether you are seeking privacy for your home from prying eyes, events privacy, increased security or protection from stormy windy weather, our fence nets and fence tarps are suitable for a range of outdoors use regardless of the weather. These nets can act as a boundary or security barrier, they provide shelter from the wind and provide shading by acting as a heat deflector. They are easy to install and are recognised for their hygiene and longevity. This type of netting is adaptable for use in residential, commercial and public sites and can be used for pool areas, construction and demolition sites, outdoor public areas, golf courses, events, landscaping, gardens, conservatories, pet areas and much more. Our fence nets are made from durable HDPE knitted tape and have a reinforced edge for extra strength and eyelets around the periphery. The fence tarps are made from HDPE tape fabrics are LDPE coated and hemmed with polypropylene rope all around and are made to fit the Heras style galvanised fence panels. The nets are UV stabilised and water resistant, making them ideal for outdoor use. 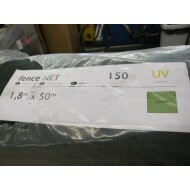 Fence nets are wind proof, very durable and are ideal to use on construction sites or at events wher..